Sony confirms launch plans for 3D TV, Blu-ray and PS3 3D games | What Hi-Fi? A further PS3 firmware upgrade to make the games consoles 3D Blu-ray disc compatible will be made available later in 2010. As part of the June launch strategy, Sony Computer Entertainment Europe will release four 3D stereoscopic PS3 "game experiences" through the PlayStation Network, available as a free collection to anyone who buys a Bravia 3D TV. The four 3D game experiences are based on Wipeout HD, Motorstorm Pacific Rift, PAIN and Super Stardust HD. The first Sony 3D TV to go on sale will be the KDL-HX803 series, available in 40in (£1400) and 46in (£1600) screen sizes. 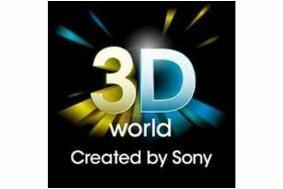 It will be followed within weeks by several other models in Sony's 3D TV line-up. As for software, Cloudy With a Chance of Meatballs and Deep Sea 3D Blu-ray discs will be bundled with selected Sony 3D TVs and BD players. The Cloudy With a Chance of Meatballs 3D disc will also be sold separately at participating retailers from June 14th for £25. Now to the thorny issue of 3D glasses. While the flagship Sony LX903 3D TV will come supplied with active-shutter 3D glasses and a built-in transmitter as standard, buyers of the HX803 models will, for a limited period, be able to get a special accessory pack containing two pairs of active-shutter 3D glasses and a 3D transmitter at no extra cost. Sony says its 3D glasses will have an average battery life of around 100 hours and an auto shut-off function. Smaller pink and blue glasses will be available for children. Finally, 3D Blu-ray players. The Sony BDP-S470 '3D-ready' model is already on sale, and a 3D firmware upgrade to make it fully 3D-compliant will be released in June. The BDP-S570 Blu-ray player, which is fully 3D capable out of the box, will go on sale in May. As we've already reported, Sony and FIFA have announced they'll be filming 25 matches from the 2010 World Cup in South Africa in 3D.